Clean and marinate fish with seasonings for about an hour in the fridge, then turn over and do the same. Dice vegetables and 1 lemon slice. Heat pan pour in teriyaki sauce mixture. Add vegetables and cook till soft. Stir in cornstarch and dish out salad on serving plate. Pat dry fish and coat with corn flour. Heat oil and pan fry cod fish till slightly char. Do the same for the other side and the skin. Drain and place fish on plate with vegetables. 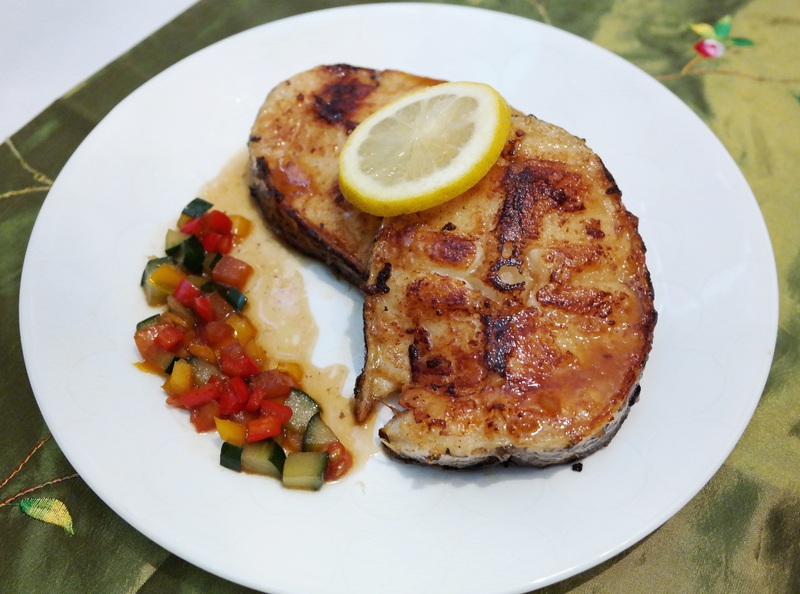 Drizzle excess salad sauce onto fish and top with a slice of lemon for that additional zest! Your Yummy Japanese Style Pan-Fried Teriyaki Cod Fish ( 日式香煎鳕鱼 ) is ready for the table!